Affordable Accoutrements: A Pink, Pink Rose? I'm joining Beverly of How Sweet the Sound this week. This marks the second anniversary of her very popular weekly event. Visit her HERE and check out all Beverly's pink-loving participants! It was such a beautiful, sunny day that I decided to set a table for two on the deck. I was in the mood to keep it simple. I quickly assembled an unstructured arrangement of fresh garden flowers (as I did last week and the week before). I also draped a garland of native clematis and old-fashioned pink shrub roses over the railing next to the table. In keeping with the simple approach I was taking, I left the glass tabletop uncovered and opted not to layer plates -- just a dinner plate and cup & saucer at each place setting. Almost everything I used is vintage and came from various local estate sales. When asked for the source of his greatest creative inspiration, singer songwriter Bob Dylan selected A Red, Red Rose, as the lyrics that have had the biggest effect on his life. I really enjoy using these Rock Sharpe glasses! They have a formal look, and guests frequently comment on their beauty. Fortunately, they're far more durable than their appearance would indicate. Prices vary, but they can often be found at estate sales and on eBay for little more than the price of basic, mass-produced everyday glasses. Are you up for a little tabletop history lesson? This is called Libbey Rock Sharpe because it is a Libbey Glass Company's blank (Stem line # 3005) which Cataract-Sharpe Company used for their cuttings (Pattern Cut 3005-5) in their Rock Sharpe line. Cataract- Sharpe Company purchased blanks from Libbey for their fine cuttings. This stem was made during the 1930s - 1940s and has Libbey's chip-resistant "Safedge" feature which Libbey introduced in 1924. This pattern is featured in Bob Page and Dale Frederiksen's book, "A Collection of American Crystal", pg. 66, 1995. Quoted from this book:The Cataract Company was a high quality cutting operation that decorated fine handmade stemware supplied by other firms. For many years, Cataract-Sharpe had purchased blanks from the Libbey Glass Division of Owens-Illinois and decorated the crystal at its factory in Buffalo. The company made no glass itself. Cataract-Sharpe cut many intricate, deep-cut crystal patterns. Many of the designs were ornately done and brilliantly polished. 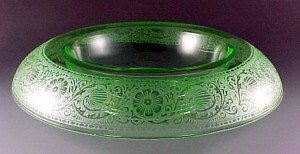 A fern-like design was a very typical design for Sharpe and it appears in a variety of their cut patterns. In the 30's and 40's, the company widely promoted its Rock Sharpe Crystal products in many of the major women's magazines. Rock Sharpe was some of the best-selling stemware in American during that period. 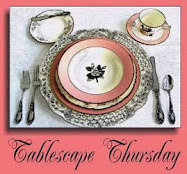 I hope you'll join Susan of Between Naps on the Porch for Tablescape Thursday. It's always great fun to see Susan's wonderful tables and those of her talented participants! Bill -- a perfect table as always -- so pretty and of course ,the silver, the crystal, the flowers are stunning! Such a beautiful poem! Also one of my favorites! And now you've provided with some beautiful imagery to go with it! Lovely table and very interesting information about Rock Sharpe glasses. I love them! There you go with that flower arranging again! I would have never thought to add hosta leaves to an arrangement. A most interesting part to flower arrangements is the foliage that is added. Have a great day! Love the lesson. I am trying to identify some of the crystal that I have bought recently. I just heard about Rock Sharpe so I shall head there for a little browsing. Beautiful pictures of your beautiful flowers. I love to have breakfast on the deck. The birds sing and the world is quiet. The flowers are fresh and ready for the day. Maybe the paper to read. Dinners that last late into the evening until the stars come out are pretty good too. The flowers are gorgeous. You must have a pretty big garden to regularly cut so much. Even when you set a relaxed table it is still so pretty and elegant. Bill, will you come and give my hubby some lessons on tablescaping?? And I was thinking the same thing as Lori- I wish I had enough of a garden to cut so much. Just spectacular! Absolutely perfect, as always! I love your flower arrangements....even your "simple" table settings are far more elegant than average. I like how you use some hosta leaves as greenery; I should try that myself when my hostas get bigger! How wonderful! Bill, you set such a beautiful table and it's always such a treat to see what you come up with each week! Thanks for sharing! Hi Bill, when I would say: "perfect table", it sounds so technical. But your table is more, it is heartful lovely, just great. Is it The Fairy Rose which you draped over the railing? The china and stemware ist great and the flowers are gorgeous as every time. But what cracks me down is, that you serve Rosé to that. You are a perfectionist! How enchanting. The table is so inviting and so beautiful. I love the simplicity of the china setting, and the crystal is lovely. I appreciate the history of it. What a wonderful decanter. I like the clear glass table, also. It makes everything sparkle that much more. Thanks so much for posting. Hi Dear Bill! Oh, how I luve your post! Luve the poetry of Robert Burns and l luve your precious little setting outdoors. Have I told you how good you are at this? You truly are! Bill, Your table for two is lovely. Your floral arrangements are simply divine! Loved seeing the climbing rose on your deck rail - still hoping for a garden tour someday. Very pretty stemware and china once again. Great table with the ultimate attention to detail. Your table setting is simply divine. The one rose on the plate brings all the beauty of the surrounding roses together. Beautiful Thank you for sharing. this table is absolutely captivating. love the roses and the china and the crystal. Love it all! I posted a comment but it didn't show up? Don't know where it went? Your table is perfection....as always! What a beautiful post, Bill, very 'springy', lol. Such eye candy! I had just complained not long ago that I hadn't done anything for myself today. Now, just by visiting, I feel that I have. What a joy to behold! Bill, This table setting is just beautiful and I loved the poem. The flower arrangement is absolutely gorgeous. Beautiful Bill. The perfect poem for the perfect setting. So beautiful and I agree -- I love your stemware! Thanks for showing us your pretty garden and reading us some poetry as well! Beautiful, as always, Bill! 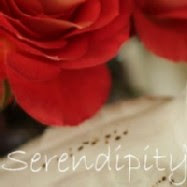 The stemware is really pretty...love your floral centerpiece. Bill, swoon, drool, sigh, gasp, stare, smile, swoon some more. This is so beautiful and ...pink. I think pink done well- in all its glory- is perfection! That is your table...perfection. Thanks for my moment of pink love. No one does it better than you! Oh, to be dining at that lovely little table in your garden! Breathtaking photos which capture the beauty of it all! It is amazing how I know you've kept it simple by not layering plates, etc, but it still looks so fancy! The poem you chose says it all too! This is so lovely and relaxing. Beautiful setting and pictures. Just absolute perfection, Bill. You know I am loving all of the pink. You should share this for our Pink Saturday 2nd Birthday celebration this weekend. Great tablescape. Makes me happy just to look at it. Beautiful, informative. It is always such a treat to visit your blog. Some of your photos are pure art. Your flowers are so beautiful! They make my peonies look puny! lol Love your table. You have a designer's touch,Bill. It's beautiful. I love that glass topped table. They aren't so easy to find anymore. Simply delightful table setting to be enjoying a sunny afternoon. What a breathtaking setting on a sunny day. I can only imagine the fragrance from the flowers. You have quite the decorator's eye. Your designs are always so glamourus. I would love to be the guest at your table. The stemware is amazing! Oh such a beautiful setting out on the deck. The pink flowered dishes are so pretty and that setting is gorgeous out in the sunshine! Have a wonderful Memorial Day weekend. Bill, this is my first visit but I'll definitely be back! Your table is beyond lovely and your garden must be amazing. Thank you, too, for some insight regarding some lovely stemware I bought at a flea market when I was just a teenager; now I have some research to do. Wishing you a wonderful long weekend. Bill, you've won my heart. I'll be right over! Lovely post. Have a wonderful Pink Saturday! What a gorgeous Pink Saturday post!! Happpy PS! what a lovely post! thanks for sharing. have a good weekend! Bill...this is sooo lovely! I don't think I could use that precious napkin...it's too beautiful! The china is lovely...you have such a gorgeous collection of vintage china...totally drool worthy! :-) Love your floral arrangement! I visited the beautiful English countryside yesterday and had a wonderful time. Your pictures have taken me right back there again. I just love your table! Gorgeous! And I love the blend of poetry and photography and pink! And I want to say I liked your Pink Saturday post as well! So sorry for the belated visit! I realize I'm two days late (and a dollar short, haha!) but there are so many pinks and so little time over this holiday weekend when relatives are visiting! Happy Belated PS! Happy Pink Saturday, Candy. We've been pinking together for almost a year now. Thank you for everything you do to make Pink Saturday special. Thank you for the birthday wishes. I love it all of your table settings, and you have certainly outdone yourself on this one. My mother has eight five-piece place settings of Heisey Orchid Etched. Plus she has many, many serving pieces in the same pattern. Every time I look at them, I think of you. I know you would love them, too. Hola Bill, landing here in your awesome blog has been a wonderful moment looking at your soooo beautiful images of your tablescapes, all of them so delicate and inspiring and beautiful.